Dove Celebration ~ a ceremonial release of white Doves to mark your occasions. Wedding doves, dove releases for reunions, graduations, grand openings, confirmations, anniversaries, birthdays and more. 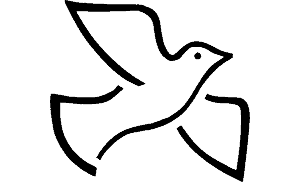 See our Dove release services for more information. Dove releases in Southeastern/Southwestern Wisconsin. Wedding releases are most breathtaking. We offer the Bride and Groom release in which 2 Doves are released by the Bride and Groom in an outside setting of your choice. 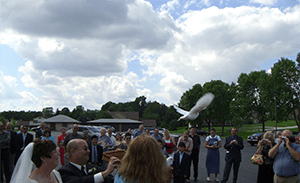 Our Doves can be released directly upon exiting the wedding ceremony or when your wedding photos are taken.